François Laporte, the President of Teamsters Canada, wrote to Prime Minister Trudeau today about trade negotiations between Canada and the Mercosur bloc of nations. The union is concerned that the Comprehensive and Progressive Trans-Pacific Partnership (CPTPP) could be used as a model for talks with Mercosur. The first round of Canada-Mercosur negotiations ends today in Ottawa. The CPTPP is a trade agreement which was negotiated mostly by the previous Conservative government and signed by the Trudeau Liberals. Mercosur is a customs union which includes Brazil, Argentina, Paraguay and Uruguay. "Signing the CPTPP, and beginning Mercosur talks without consulting our union, shattered our confidence in the government’s commitment to a ’progressive’ trade agenda," wrote Laporte. "While we are not opposed to trade, we recognize that there is such a thing as a bad trade agreement. The CPTPP is one such example. […] On labour issues, your CPTPP is in fact weaker than what Stephen Harper had negotiated in the TPP." 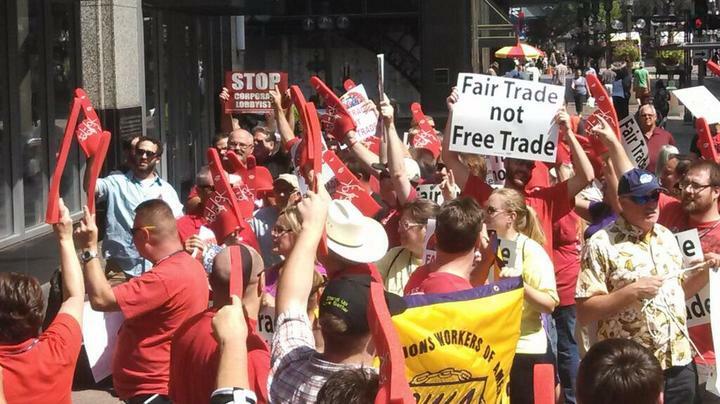 "Canada undermined its position on labour rights at the NAFTA negotiations table by agreeing to the CPTPP. We cannot demand a strong labour chapter in negotiations with the United States and Mexico, and at the same time agree to a weak labour chapter in the CPTPP." "Mercosur and all future trade agreements will need to include something the CPTPP does not have: a strong and enforceable labour chapter, which recognizes that wages and working conditions always affect trade. Violating the labour chapter would need to carry consequences that are at least as strong as those that protect commercial interests." "Moreover, no further trade agreement should be signed without first studying the impact on jobs. The federal government made no attempt to analyze potential job losses stemming from the CPTPP. With Mercosur, we urge you conduct appropriate economic modelling. It is wrong to assume trade agreements will not harm the livelihoods of at least some Canadians." "The decision to sign the CPTPP, without consultation and without a mandate from the population, was an unacceptable mistake. Regularly consulting civil society and labour unions on Mercosur will go a long way to help rebuild lost trust." Teamsters represent close to 125,000 members in Canada is all industries. The International Brotherhood of Teamsters, with which Teamsters Canada is affiliated, has 1.4 million members in North America.